This Valentine’s Day, shake-up a candy-sweet cocktail for your Valentine! The secret to our tasty drink is “Red Hots” cinnamon candies melted in water to create red-hots simple syrup. After cooling, the syrup is then shaken with ice, vodka, and grenadine. 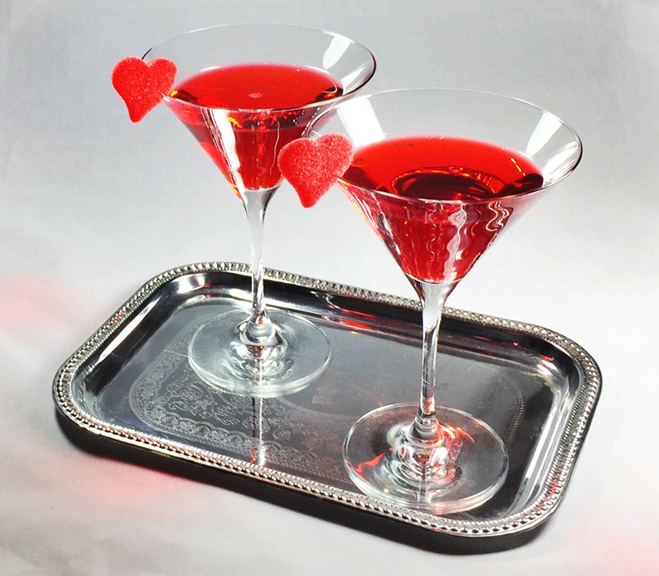 To finish, simply strain into a martini glass and add a candy heart to the rim. Add the Red Hots candy to a saucepan and cover with ½ cup water. Over medium-low heat, dissolve the candy into the water swirling occasionally. As the candy continues to melt, it starts to stick together and to the bottom of the pan. When this happens, use a wooden spoon to stir constantly until the Red Hots completely melt and dissolve into the water, about 5-6 minutes. Add the white sugar and cook another minute or until it completely dissolves. Add the red food coloring, stir in completely, and remove from the heat. Set aside to cool. Makes about 1 cup of syrup or 4 cocktails. In a cocktail shaker, add a scoop of ice, the Red Hots simple syrup, vodka, and grenadine. Shake for 30 seconds and strain into a martini glass. Using kitchen scissors, snip a ¼” slit into the side of one gummy heart. Slide it onto the rim of the martini glass and serve. Makes one cocktail.